Offers: Numerous Stay & Play discounts plus other 'season' ticket and multiple player discounts. See website or contact local booking agents. La Cala Resort boasts a five star hotel, three 18-hole championship courses designed by the renowned Cabell Robinson, a top quality six-hole par 3 layout that is attached to the only David Leadbetter Golf Academy in Spain and the only Taylormade Performance Lab in Spain (hi-tech swing analysis and custom club fitting). 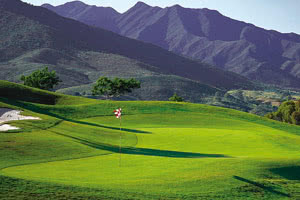 The three 18-hole courses offer different challenges. Campo America (originally the North course) hosted the Ladies European Tour Q-school in 2005 and 2006. It is longer than the tight, challenging Campo Asia (originally the South course). This course welcomed the top Spanish professionals in 2007 for 18th PGA Spanish Pairs Championship, won by Miguel Ángel and Andrés Jimenéz. Campo Europa opened in 2005 and has already drawn much favourable comment from the top players who regularly play and practice in La Cala. The par 3 course offers a great opportunity for beginners and experienced players alike to practice. It is quite challenging and offers views to the Mediterranean. The David Leadbetter Academy has covered and grass driving bays and the team of teaching professionals can design a teaching plan specially tailored for your needs. Advanced technologies available include Europe’s only TaylorMade Performance Lab, a SAM putting lab, zenoLINK biomechanics analysis, etc. There is also a practice green and a club-fitting service for any important equipment adjustments. The clubhouse is the location for the fully-stocked pro shop, a gymnasium and saunas in the luxurious and recently renovated dressing rooms.